God writes the Gospel, not in the Bible alone, but also on tree, and in the flowers, and clouds, and stars. Thank you Partakers, Lay Minister and JT. I am grateful to Luther for his amazing theological insight–that a man is saved by faith alone, without the deeds of the law–though I agree of course that his visceral distaste for the Jewish people was wrong, and has led to many unfortunate consequences! Yes, Luther got something horribly wrong…like the rest of us, his “many sides” included error. It does not negate the rest. Did David's sin with Bethsheba make him “no longer a man after God's own heart”? No. 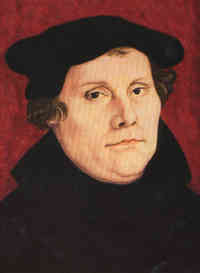 Unfortunately Luther also wrote in his book called The Jews and their lies, “Therefore be on your guard against the Jews, knowing that wherever they have their synagogues, nothing is found but a den of devils in which sheer self­glory, conceit, lies, blasphemy, and defaming of God and men are practiced most maliciously and veheming his eyes on them.” He advocated burning Jewish books, synagogues houses, forbidding them to work at professions and even killing them Sounds familiar? Many sided indeed. These quotes are fantastic :)!